Olentangy Liberty’s Llwyatt Hofer and Kal Jayaraman combine to block a shot by Orange’s Luke Ballinger during the first half of Friday’s OCC showdown in Powell. POWELL – One motivation took precedence for Olentangy Liberty senior Ben Roderick. It’s his senior season and there are a lot of lasts ahead of him. One of those lasts – playing rival Olentangy Orange on his home court – came Friday night. He responded with a game-high 37 points, nine rebounds and three assists to lead the Patriots to an 81-66 win in the OCC-Buckeye opener for both teams. Roderick scored eight points to lead the Patriots in a decisive 18-5 run to end the third quarter. Liberty coach Greg Nossaman understands this idea of lasts. 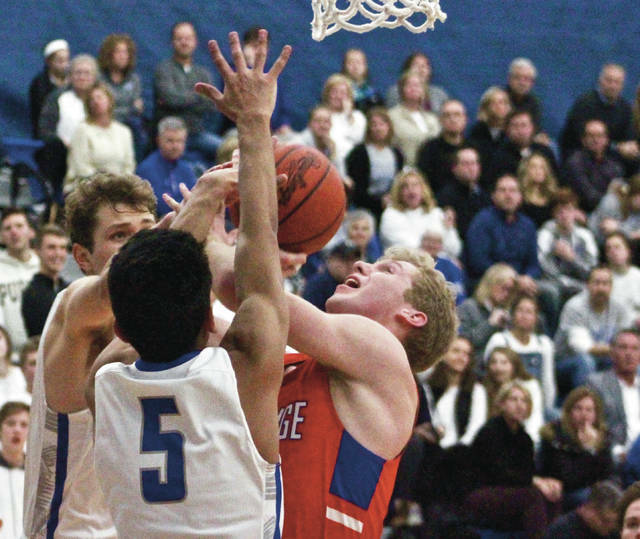 Henry Hinkle pitched in 15 points, Nick Nakasian added 12 points and nine boards and Mitchell Kershner chipped in 12 points and seven boards to lead the Patriots (1-1, 1-0). Nik Brannon beat the halftime buzzer with a three-pointer from the top of the key to tie the game 30-30 at the break. Orange opened the second half 7-0 when Ryan Cutler scored off his own steal, Brannon scored underneath and Lane buried a three-pointer. Bryson Lane had 22 points, Darius Butler added 12 points and five rebounds and Luke Ballinger chipped in 10 points, five boards and three assists to lead the Pioneers (2-1, 0-1). Roderick led Liberty’s effort in the fourth quarter too, scoring 14 points in the frame, including a perfect 6-for-6 at the foul line to salt it away. Orange is right back at it tonight when it hosts Walnut Ridge in non-league play. Liberty is off until Friday night when it continues league play with a trip to Westerville South. Both are scheduled for 7:30 p.m. tip-offs.